Here at Ovarian Cancer Action we’re all about making noise and spreading awareness far and wide. Frustratingly though, sometimes myths are perpetuated among this noise. So we’ve take the opportunity to address 8 myths surrounding ovarian cancer. Ovarian cancer is often referred to as the silent killer as it’s sometimes said to have no symptoms. This, however, is not true. The four main symptoms of ovarian cancer are persistent stomach pain, persistent bloating or increased stomach size, difficulty eating or feeling full quickly and needing to wee more frequently. These can happen to us all sometimes but the key is persistence. If the symptoms are unusual for you, and they don’t go away, speak to your GP. Ovarian cancer is not as well-known as some other female cancers and there are a lot of myths surrounding this devastating disease. With more than 7,000 diagnoses, and 4300 deaths, in the UK each year ovarian cancer is the fifth most common female cancer - and it’s oft-associated with women over the age of 50. Whilst it is true that some 80% of the women diagnosed each year are 50 plus, that leaves one in five who are younger. There is no routine test for ovarian cancer – a cervical smear won’t detect the disease. 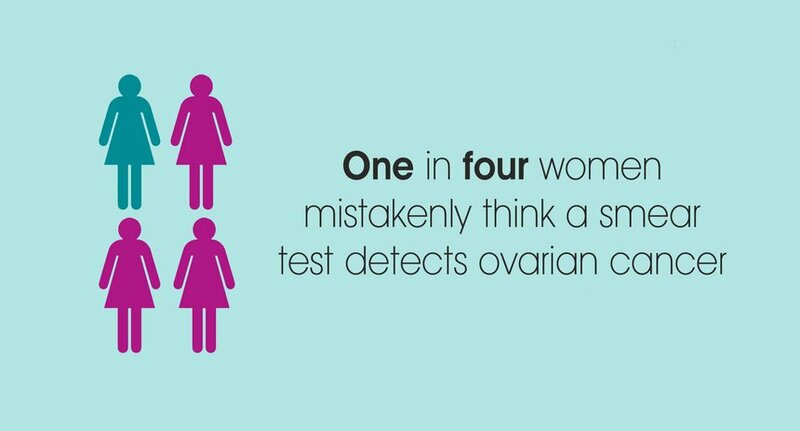 The best way to detect ovarian cancer is by being symptoms aware. If you suspect something is wrong, keep track of your symptoms. Search for Ovarian Cancer Action in your phone’s app store, or download a symptoms diary to help. And get to know your family history as you can be at increased risk – see 'BRCA only means breast cancer', below. Sadly, there are lots of different gynaecological cancers so it pays to be aware of each one. The five main gynaecological cancers are cervical, ovarian, uterine, vaginal and vulvar; and each has different symptoms. Get to know your body and speak to your GP if you suspect anything is wrong. Evidence suggests taking the contraceptive pill reduces your risk and a few lifestyle factors can increase your chances of developing ovarian cancer. These are smoking, obesity, giving birth to your first child after 30, not having any children, not breastfeeding, and using HRT. Other contributing factors include a family history of breast and ovarian cancer, getting older and having endometriosis. Find out more about risk factors. A BRCA gene mutation (the same gene mutation Angelina Jolie has) is often discussed in the media alongside an increased risk of getting breast cancer. If you have a BRCA gene mutation, you have a 35-60% increase of developing ovarian cancer too. BRCA gene mutations can be hereditary. To explore your family history visit our BRCA hub. Unfortunately the HPV (human papilloma virus) vaccine does nothing in the way of preventing ovarian cancer. The vaccine, which is routinely given to girls aged 12 and 13 in England, protects against cervical cancer but there is currently no equivalent vaccine available to protect women from developing ovarian cancer. There are different types of hysterectomy. Usually the womb and cervix are removed and, in some cases, the fallopian tubes and ovaries too. While removal of the ovaries reduces risk by 95%, there is still a 5% chance of ovarian cancer cells developing. You also risk developing primary peritoneal cancer, which is similar to ovarian cancer. Again, if you suspect anything is wrong at all, speak to your GP. Find out more about ovarian cancer.